With the number of basic Alarm apps throughout the App Store and Google Play Store now well over a billion strong, the devs looking to improve the management of our sleeping habits are being forced to work a little harder and bring something different to the table. There’s been a marked uprising in apps purporting to help those using them to get optimal sleep by counting cycles, playing various ambient sounds, tracking stats, recording breathing.. you name it, it’s been done. ‘Sleep as Android’ takes a couple of these tried and tested methods, allowing you to track your sleeping habits and wake up gradually, supplemented with natural sounds. It also claims to wake you up in the optimal sleep phase, playing on the scientific research to wake you up gently when you’re in the lighter segments of sleep. It presents itself on a nice, dark interface – aesthetically pleasing while also managing to not be too much of a strain on the bed-bound eye. Late last month, we covered Sleep Cycles, which offered a similar service. The sleepyti.me calculator – which uses the amount of feasible rest time you have to calculate the best, between cycle wake-up time – professes to offer the optimum nap time for best possible physical and mental performance. Whilst I’ve no scientific knowledge on the matter, I will chip in that I do notice a positive difference when keeping my sleep in accordance with the 90 minute cycles. Indeed, the sleepyti.me calculator has 100,000 cosigners through Facebook, suggesting there is some legitimacy in the current bandwagon-jumping by app developers. 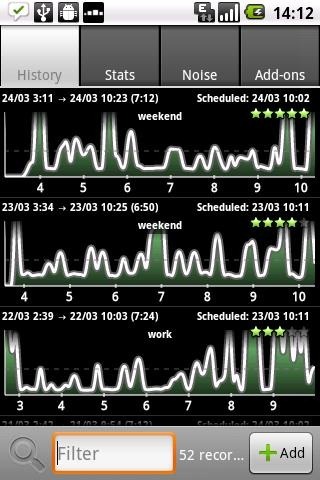 ‘Sleep as Android’ also offers a neat graph tracking your sleep history, sharing via Facebook and email, and a plethora of nature sounds (birds, sea, storm, the usual), all of which ascend for a less coarse awakening. While some of the noises are debatable in terms of their relaxation qualities, there’s certainly something in there for everyone. The free version offers a two week trial, and the fully-unlocked iteration can be purchased for a couple of dollars. Be sure and let us know if it helps you catch some sleep by leaving a comment via our Facebook or Google + pages.